Which Atari 2600 model is your favorite? Heavy Sixer, Light Sixer, 4 switch Wood Veneer, Darth Vader, and Junior. Sears models, Intellivision atari adapter, Geminis, Colecovision expansion module 1's, Atari 5200 VCS adapter. As per his request the 7800 is purposely not listed. Thanks Shawn for taking my request!!! Anyways, I had to choose the Heavy Sixer myself. Love the six metal switches, the thick molding, and of course the woodgrain finish. My first 2600 was the Light Sixer I still have from when I was a little one. My mom and dad got it in 1980 or '81. My next since I began collecting as I got older is the 4 switch woody which is used as my main choice for 2600 gaming. Then got the Vader several years ago. Then last Summer justba week before my birthday I went to a local gaming store where I live called Movie Trading Company in North Dallas. Right in the case. Low and behold out in the wild. A Heavy Sixer 2600 in mint condition for $50!! Grabbed it, took it home, took It apart and cleaned It up all nice, and plays flawlessly. One ne of the best birthday gifts to myself ever!! I love to keep it in fantastic shape and play it sparingly. The Fat Sixer has the best color pallete! I'm pretty sure that after it they all had a seemingly reduced color selection!?! I really don't remember if my 5200 adapter had the original colors or not. Do any systems or adapters beyond the original have the first color set? Your 4 switch wood grainer must have been one of the earlier made ones manufactured. Mine was January 1982. Also born the same year as me!! 1981! I'll be 34 this Summer. Sweet. I'm actually a Jan baby, 24th to be exact. The docs miscalcuated my due date and my mom had planned a C-section operation on February 14th if I didn't come sooner but I was ready to come out 3 weeks ahead of schedule! May 1980 - Jan/Feb 1981 is in the 9 month ballpark, so I like to believe my Atari was "conceived" around the same time I was. Birth of the console would actually be the "unboxing" event and no telling when that happened, very likely Christmas 1980. EDIT: Wow, that was one of my weirder posts. Gotta stop staying up all night and into the morning posting random crap! Edited by stardust4ever, Wed Apr 29, 2015 5:59 AM. eBay finally brought us together in 2012, yay! She needed a bit of TLC but I refurbed her with a new regulator, filter cap, real coax RF cable with a ferrite choker, and lastly adorned her with a limey green power LED next to the turn-on switch. Stella's my gal... EDIT: Wow, that was one of my weirder posts. Gotta stop staying up all night and into the morning posting random crap! I know 1980 is when the 4 switch woodys supposedly came out. I hardly see any manufactured ones for that year. Mostly Light Sixers. My Light Sixer was made in June '80. Heck, I even seen a bunch of 1981 manufactured Light Sixers posted on threads. I have all the 2600 models. I use my 4 switch woody as the predominant choice for my vcs gaming and the 7800. When we were talking about the vs.Duck Hunt the other day, I had to change my avatar to that. I like playing it on my smartphone from my mame4droid app. Use touch screen controls for it, and is fun to play. I remember first playing Vs. Duck Hunt at my local 7-11 with my dad back in 1986-1987. Funny they use to have arcade cabs there. I guess there Is proof that photoshop dated far back to the early 80's. It actually caught my eye that a 4 switch woody on this box has heavy sixer molding lol. The Heavy Fourser! Learn something new each day. I am for Sears Tele-Games all the way! Doesn't matter if it is a 4 or 6 switch. I hope somebody can relate to my story! Christmas morning 1981 - I was slightly disappointed to receive a Sears TeleGames Video Arcade . The rest of the kids in the neighborhood received a "normal" Atari. None of them understood that my system was made by Atari too. Some parents even questioned me, after hearing from their kid, that I didn't get Atari - I got a TeleGames! Yea, I received the same blank stare from them too, when I tried to explain! I know, life was tough back then! Edited by AtariKid81, Wed Apr 29, 2015 6:47 PM. Interesting. So my 4-switch Atari might be a rare early model? I've also got an NES with the smooth lid, serial #N4851056. I wasn't aware of the presence of a difference between the NES consoles but many later units had textured surface. Wierd thing is mine is a CIB Action Set. I would have thought the NES sold more during it's earlier years but apparantly not so. For the record, my 4-switch Woody has a serial #81817660. Certainly there were never 80 million of these made so I don't know if they are in sequence or not. It also has the red Atari Super Service sticker on the bottom with 800 numbers for California and the continental US. Pretty sure those numbers have long been decommissioned or reassigned to other businesses. Edited by Papa, Thu Apr 30, 2015 12:14 PM. 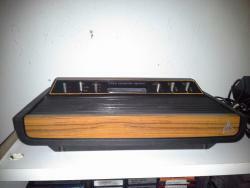 I don't have any Sears model VCS' s. I have all of the genuine Atari branded models. I want to get the Sears models to add to my collection as well . I especially like the Sears Heavy 6er. I like the fake walnut wood grain and LED style lettering of "Tele Games" on the cart slot as well. It's like the Intellivision too back in the early 80's. Radio Shack and Sears made them as well. Ala Tandyvision and Super Video Arcade. I was a baby during that time. But people in their 40's always told me about life of Atari vs. Sears back in the early 80's. In that case, my favorite "model" would have to be the Flashback 2! Edited by stardust4ever, Thu Apr 30, 2015 9:18 PM. They can play with my joystick anytime. My favorite is the light sixer because that's the first model I ever played in Penny's department store as a kid. By the time I got one of my own, only the four switch woodys were being sold new. I got and played a four switch for many years and still have it. A few years ago, I finally acquired a light sixer via ebay. My sixer also needed a new 7805 regulator and power supply. I think that and the ratty worn out joysticks is why I got it for not so high a price. Today, I use Flashback II joysticks with it for everyday gaming. They are good, except the handles sometimes come unscrewed during game play! Yeah kind of ironic the OP listed the whole gamut of add-on modules designed for other consoles but not the officially b/c 7800. Edited by Papa, Sat May 2, 2015 7:30 AM. While I prefer the look of a 6-switch (especially sears), it has a heavier RF shield. Some carts fit too snug, potentially scraping/damaging the labels. 7800 colors look washed out/less vibrant. 5200 adapter just looks wrong, like it doesn't belong but someone jammed it into the 5200 anyway. Coleco adapter relies on the Coleco's iffy power supply, plus there's a split second delay at power up. Vader has soldered chips usually, socketed chips are easier to replace if needed. Never had INTV/Gemini so can't comment on performance, but scarcity knocks them out of the running. 4 switch woodgrain is easy to find, easy to maintain, and easy to play. Solid colors, solid switches, solid performance. The heavy sixer totally took this poll by storm! I don't understand why there is a difference between the light and heavy siwer, but all Sears models are lumped together? I mean, there is quite a difference between the light sixer with it's more gorgeous faux wood look and the LED panel display fonts on it, and the Sears Video Arcade II and his 7800 design?